The period of three months of summer are called luxuriant flowering. The chi of Heaven and Earth mingle. The ten thousand things bloom and bear fruit. At dark to bed, early to rise. Do not tire of the sun. Keep that which is of the heart/mind from anger. Allow the finest things to flower fully. Allow the chi to leak (sweat). Act as though you love the outside. This is the summer compliance of chi (and) the cultivation of the Dao of lengthening. To oppose these principles injures the heart. powerful is fire. Fire burns giving heat, light and life. The source of all fire in the world is the sun. This, then is the time to enjoy the sun, which is why the Nei Jing tells us “not to tire of the sun” and to spend time outside. Of course too much fire burns and that will damage the skin, affecting our wei chi or protective chi, which is a very important part of our immune system. 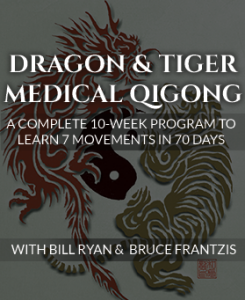 (One of the great benefits of Dragon & Tiger Chi Gung is that it clears and strengthens the wei chi). The organ most closely associated with summer is the heart. The word for heart in Chinese also means ‘mind’. It encompasses a much broader understanding than we have in the west. The heart has a very special role as it is the ruler, not only of all the other organs and the blood, but also the emotions, thoughts and the spirit. If the heart is disturbed nothing else will function well. Keeping the solar plexus and midriff open and constantly moving the shoulder blades during Tai Chi, nei gung and chi gung is very important to the heart’s health. 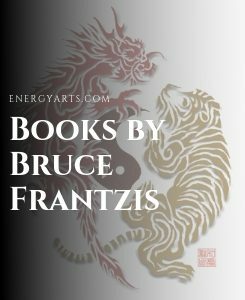 It is all part of what is called, ‘sinking the chest and raising the back’ (han xiong ba bei) and ‘sinking the shoulders and dropping the elbows’ (chen jian zhui zhou). Summer is the time to pay particular attention to these alignments. Summer is ruled by the ‘Dao of lengthening’ (chang zhi dao). The word for ‘lengthening’ in Chinese, ‘chang,’ (pronounced ‘t∫a:ŋ’ with a rising tone) has a range of meaning, including: long; lengthen; strong; to be good at; to grow; to increase; to advance. Thus, chang zhi dao also means, ‘the Dao of growth’, ‘the Dao of increase’ and ‘the Dao of strength’. The translation ‘the Dao of lengthening’ is particularly relevant to our endeavors as tissue lengthening is an essential component of internal practice. Without it we cannot properly activate the ligaments, open and close the joints or spiral the tissue. Lengthening does not make these things happen, but it does make them possible. It is necessary to have tissue lengthening before we can move on to the more complex aspects of internal work. 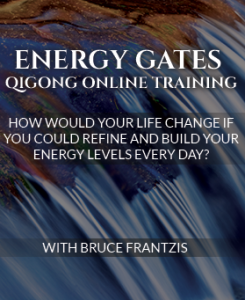 Chang is the general principle of increase that is activated in the summer. Everything grows in the heat. This is the time to allow the body to release open. What was tight in the winter can now loosen. Recognizing that the heat of summer can be our friend can be quite liberating. not’. For, by so acting we will come to recognize the benefits of the warm weather. Many people do not like hot weather and see only its negative side. 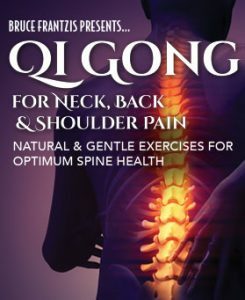 This prevents them from seeing how useful it can be for opening the body and releasing tension and stress. Acting as though we love the outside can help us overcome our dislike of the heat and to make the most of the season. With summer comes the opportunity to grow. stability by correctly nourishing it and not damaging it, to the extent that it fills the space between Heaven and Earth. . . . One must work at it, but not rigidly. Do not forget about it, but do not help it to grow either. Do not be like the man from Sung. There was a man from Sung who was worried that his crops were not growing, so he pulled on them. Wearily, he returned home, and said to his family, ‘Today I am worn out; I have been helping the crops to grow!’ His sons rushed out to look, but the crops had already withered. This is a beautiful illustration of the golden mean, which Bruce refers to as the 70% rule. As with any aspect of nei gung, working at it, but not rigidly, is crucial. Our passage from the Nei Jing warns us not to make the mind angry, ‘nu‘ in Chinese. The word ‘nu‘ also means ‘to sprout or spring up with vigor’. This implies that a heart/mind that is over-stretched will become angry. The literal meaning of the word ‘angry’ here is ‘enslaved heart/mind’. An angry heart/mind is a slave to the emotions, which means that it has lost its proper function is as ruler. Having a strong, balanced heart/mind will allow that which is best in us to develop fully. foods: watermelon is particularly good as is green tea (not too strong). Other cooling foods are: bean sprouts, Chinese leaf, bamboo shoots, water chestnuts, green leafy vegetables, tomato, cucumber, asparagus, seaweed, mint, fish and shell-fish.